I am just back from the fabulous 2010 Sweets & Snacks Expo in Chicago -- the largest candy trade show in the Americas -- and one of the many exciting things I discovered there (while experiencing the three days as a complex sort of deja vu, given the scenes in True Confections that take place at this show, where this year I was signing books in the Candy Industry Magazine booth) was that America's favorite flavor is "red." Cherry, strawberry, whatever -- so long as it's red. This is why one of the dominant new flavors popping up across a range of familiar products is pomegranate. 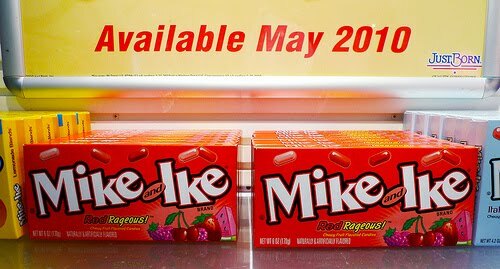 And then there's the just-released variation of Just Born's Mike and Ike -- Red Rageous, a mix of red flavors (grape, raspberry, cherry, strawberry, melon). If Alice Ziplinsky had known that most people think their favorite flavor is red, she would have had something to say about that in the pages of True Confections. 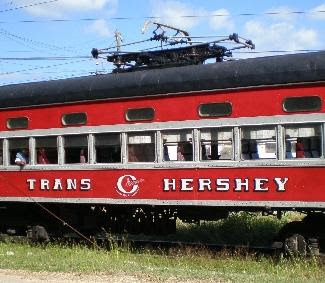 Why didn't I include a reference in True Confections to Milton S. Hershey's train, still functioning in Cuba today? In 1927, Hershey, having first established his own sugar refining source in Cuba in order to avoid being at the mercy of fluctuating sugar prices, built his own train line that crossed the island, making it possible for workers to travel easily to the Hershey sugar cane factory, and to transport the sugar back to the harbor, for export to his chocolate manufacturing plant in Hershey, Pa.
Hershey was an extraordinarily thoughtful, idealistic, humanitarian, and also very, very practical businessman. He decided to locate his sugar refining operation in the province of Matanzas because he believed its higher elevation was a healthier (and therefore more productive) location. Hershey constructed a small village near his sugar cane plantation, rows of workers’ cottages with front porches and tile roofs. Unlike most sugar plantations, the Hershey operation paid weekly wages, instead of hiring and firing workers seasonally. The Hershey village had a medical clinic and grocery store, and he provided this little worker community with a school, complete with playground, and its own power plant generating electricity, as well as sewers and a water supply. All of this was in the name of productivity, but there was also a fascinating and admirable humanitarian intention manifest in this way of doing business. Milton Hershey guessed wrong about the longterm stability of Cuba when he chose his sugar plantation location for its proximity to the U.S., and when Castro came to power in 1959, Hershey enterprises were closed down. Today the plantation is a jungle, and the workers' village is a ghost town, but the train still runs. Alice Ziplinksy would have had something to say about this, probably an identification with Hershey's good intentions being thwarted. Why wasn't there a ritual circumcision for Jacob Ziplinsky in True Confections, complete with a contentious Ziplinsky family gathering and a chopped chicken liver centerpiece? How could I have overlooked this opportunity for Alice Ziplinsky to report on, mock, analyze, and feel superior to this particular Ziplinsky family custom? Rats.